While passing time over at Plastic and Plush, I came across this delightful pink vinyl toy called Hot Cha Cha Cha, by artist Gary Baseman. This special Pink edition figure is strictly limited to 500 units worldwide and comes in an individually-numbered package that’s a work of art in itself. Retails for $99.95. Sounds a bit pricey to me. Your mileage may vary. 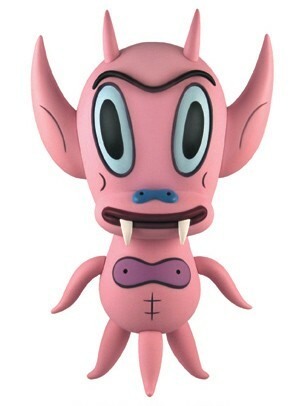 Umm, does anyone else notice the pink alien’s middle tentacle looks like a ding a ling? Pingback: The Worley Gig » Blog Archive » Pink Thing of the Day: Pink HotChaChaCha Painting!